May 2015 - We only hear "jet packs activated" in movies. 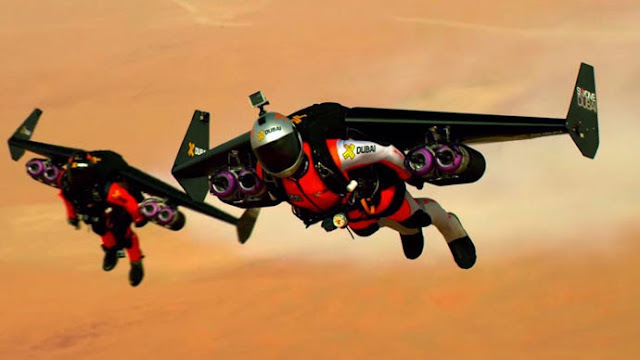 But Yves Rossy and his protege, parachuter Vince Reffet of Jetman Dubai team, made this to reality as the duo performed a variety of tricks while flying over the desert and into the skyscrapers of Dubai, including the world's tallest Burj Khalifa. April 2015 - The event saw the use of numerous zip lines utilising over 10 kilometres of rope as well as the construction of an eight metre long jump platform suspended 400 meters high. More than 600 dream and base jumps took place over the course of the two weeks. April 2014 - Two French daredevils broke a Guinness World Record for the highest Base jump after jumping from the pinnacle of the Burj Khalifa and spiraling down the world’s tallest man-made structure. 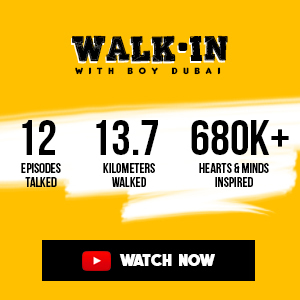 Professional base jumpers Vince Reffet and Fred Fugen broke the record after performing two base jumps from the top of the 828-metre Burj Khalifa. December 2014 - The UK based Breitling Wing Walkers flew over the skies of the Dubai Marina, JBR and the Palm in their UAE debut exhibition as part of the Skydive Dubai XCAT World Powerboating Series. The flying team use two Breitling-liveried 1930s Boeing Stearman bi-planes to execute thrilling aerial stunts that include acrobatic girls battling high speed wind and g-forces to ride on top of the wings of the plane. Of all the extremes, this has been one common bucket list item for many thrill-seekers, A-list celebs included. Skydive Dubai is one of the world’s most preferred premier skydiving location, mainly because of the breathtaking scenery of the luxurious Palm Jumeirah and the skyline of Dubai Marina while descending at 210 km/hr. These youngsters who call themselves "Crazy Russians" produce terrifying videos as they climb high rise buildings without any protective gears, rappel and no insurance at all. And yes, they did it in Dubai as well. March 2011 - French climbing legend Alain Robert, popularly known as the French spiderman, took more than 6 hours to reach the summit of Burj Khalifa. He started at 6:10pm and reached the top by 12:30am. April 2015 - Alain Robert returned to Dubai to climb the 75-storey Cayan Tower in Dubai Marina - the worlds tallest twisted tower. He started ascent at 8.25pm, without the protection of a safety harness and with only a small pouch for chalk to dry his hands, the 52-year-old reach the top of the building at about 9.30pm. It may not be as extreme as the others, for for the sake of stunning aerial exhibitions, I'm closing it with the Balloon Jump. This is pretty much similar to Skydiving but skydivers are jumping from a hot air balloon - which just adds thrill to it. Did I miss any? Please feel free to write them on the comments below.